The seven-seat Everest will be the first Ford SUV sold with the company's Chinese partner Jiangling Motors Co. Ford now makes its SUVs in China with Chongqing Changan Automobile Co.
BEIJING -- Ford Motor Co. is showing a seven-seat, mid-sized SUV concept at the Beijing auto show that previews a new vehicle to tap booming demand for crossovers in China. The Everest Concept is an “off-road SUV” to be built locally by Ford’s Chinese partner Jiangling Motors Co., the company said. Ford’s Asia Pacific design team in Australia developed the vehicle. It sports key Ford design cues, starting from a prominent inverted trapezoid grille. “Around the world, Ford continues to develop and launch global SUVs of all sizes, to meet the growing and dynamic demands of our customers. They play an important role in driving Ford’s growth,” Ford China CEO John Lawler said in a statement. The SUV market in China grew 49 percent last year, according to Ford. “We see tremendous opportunity in this segment over the coming five years,” Lawler said. Ford’s global utility vehicle sales jumped 37 percent in 2013 to 1.2 million units, compared with 13 percent growth for the segment overall, Ford says. In China, Ford’s share of the utility market rose from 0.3 percent in 2012 to 4.5 percent in 2013, with record sales of more than 150,000 vehicles. 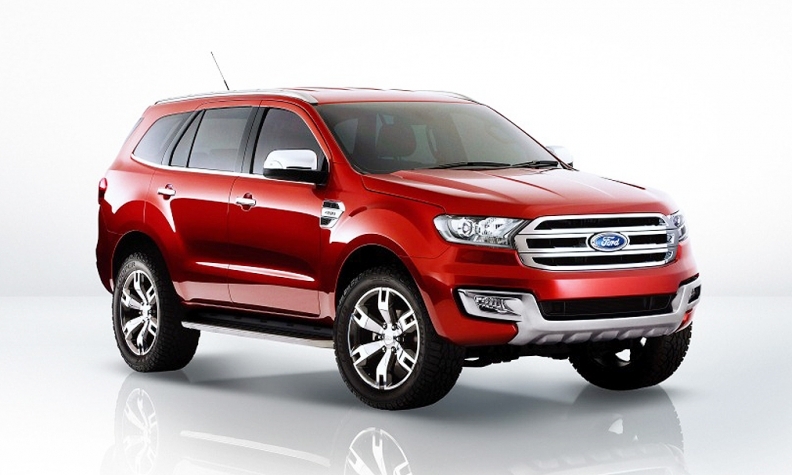 Ford did not detail potential overseas sales plans for an Everest-based vehicle. The body gets a swept back aerodynamic look. At the rear, designers placed prominent, chiseled tail lamps over a negative scallop. The Everest features high clearance to telegraph off-road potential. China's crossover market is rapidly expanding but the hottest segment is small crossovers, which are less expensive and more maneuverable in the country's crowded cities. China's three top-selling SUVs -- the Great Wall Haval H6, Volkswagen Tiguan and Honda CR-V -- are compacts. In fact, nine of the 10 top-selling SUVs last year were compacts. China's annual light-vehicle sales are growing 10 to 15 percent a year, down from more than 30 percent in 2009 and 2010. Yet SUV sales continue to soar more than 40 percent each year. Ford already has two small entries, the Kuga and EcoSport, in China. A locally made Everest would round out the upper range of the segment.